A digital watermark is a digital signal or pattern inserted into a digital image. Since this signal or pattern is present in each unaltered copy of the original image, the digital watermark may also serve as a digital signature for the copies. A given watermark may be unique to each copy (e.g., to identify the intended recipient), or be common to multiple copies (e.g., to identify the document source). In either case, the watermarking of the document involves the transformation of the original into another form. This distinguishes digital watermarking from digital fingerprinting where the original file remains intact, but another file is created that "describes" the original file's content. As a simple example, the checksum field for a disk sector would be a fingerprint of the preceding block of data. Similarly, hash algorithms produce fingerprint files. key. Unlike encryption, however, digital watermarking leaves the original image or (or file) basically intact and recognizable. In addition, digital watermarks, as signatures, may not be validated without special software. Further, decrypted documents are free of any residual effects of encryption, whereas digital watermarks are designed to be persistent in viewing, printing, or subsequent re-transmission or dissemination. Two types of digital watermarks may be distinguished, depending upon whether the watermark appears visible or invisible to the casual viewer. Visible watermarks are used in much the same way as their bond paper ancestors, where the opacity of paper is altered by physically stamping it with an identifying pattern. This is done to mark the paper manufacturer or paper type. One might view digitally watermarked documents and images as digitally "stamped". The visible watermarks which appear in Figures 1 and 2 illustrate the technique. The watermark in Figure 1 appears is quite obtrusive because of the high contrast between the background and foreground drawing. There is no place for the watermark to "hide" as it were. The colored image in Figure 2 renders the visible watermark less obvious. Figure 1.Digital Copy of fifteenth century drawing with digital watermark superimposed. 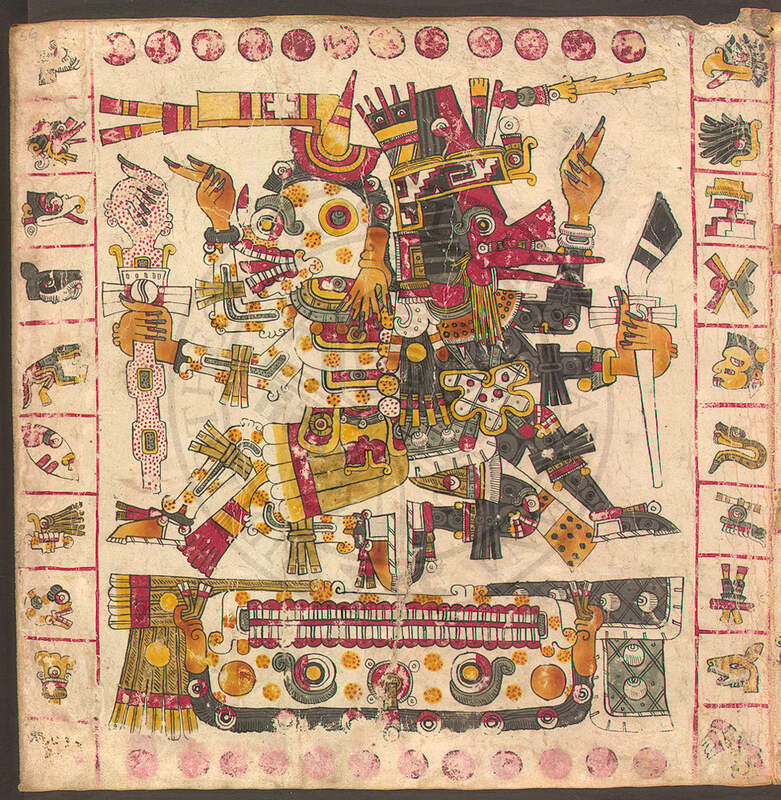 Figure 2.Digitized copy of artwork from a sixteenth century Aztec manuscript. Source: IBM's Digital Library project. Invisible watermarks, on the other hand, are potentially useful as a means of identifying the source, author, creator, owner, distributor or authorized consumer of a document or image. For this purpose, the objective is to permanently and unalterably mark the image so that the credit or assignment is beyond dispute. In the event of illicit usage, the watermark would facilitate the claim of ownership, the receipt of copyright revenues, or the success of prosecution. Watermarking has also been proposed to trace images in the event of their illicit redistribution. Whereas past infringement with copyrighted documents was often limited by the unfeasibility of large-scale photocopying and distribution, modern digital networks make large-scale dissemination simple and inexpensive. Digital watermarking makes it possible to uniquely mark each image for every buyer. If that buyer then makes an illicit copy, the illicit duplication may be convincingly demonstrated. Visible and invisible watermarks both serve to deter theft but they do so in very different ways. Visible watermarks are especially useful for conveying an immediate claim of ownership. The main advantage of visible watermarks, in principle at least, is that they virtually eliminate the commercial value of the document to a would-be thief without lessening the document's utility for legitimate, authorized purposes. A familiar example of a visible watermark is in the video domain where CNN and other television networks place their translucent logo at the bottom right of the screen image. Invisible watermarks, on the other hand, are more of an aid in catching the thief than discouraging the theft in the first place. TABLE 1 CAPTION: Visible and invisible watermarks act as a deterrence to theft in different ways. Visible watermarks diminish the commercial value of the document or image. Invisible watermarks increase the likelihood of successful prosecution. Invisible watermarks may also act as a deterrent if perpetrator is aware of their possible use. for some invisible watermarking applications, watermarks should be readily detectable by the proper authorities, even if imperceptible to the average observer. Such decodability without requiring the original, un-watermarked image would be necessary for efficient recovery of property and subsequent prosecution. One can understand the challenge of researchers in this field since the above requirements compete, each with the others. The litmus test of a watermarking method would be that it is accepted and used on a large, commercial scale, and that it stands up in a court of law. None of the digital techniques have yet to meet these tests. Watermarking techniques tend to divide into two categories, text and image, according to the type of document to be watermarked. Techniques for images: Several different methods enable watermarking in the spatial domain. The simplest (too simple for many applications) is to just flip the lowest-order bit of chosen pixels in a gray scale or color image. This will work well only if the image will not be subject to any human or noisy modification. A more robust watermark can be embedded in an image in the same way that a watermark is added to paper. Such techniques may superimpose a watermark symbol over an area of the picture and then add some fixed intensity value for the watermark to the varied pixel values of the image. The resulting watermark may be visible or invisible depending upon the value (large or small, respectively) of the watermark intensity. One disadvantage of spatial domain watermarks is that picture cropping (a common operation of image editors) can be used to eliminate the watermark. Spatial watermarking can also be applied using color separation. in this way, the watermark appears in only one of the color bands. This renders the watermark visibly subtle such that it is difficult to detect under regular viewing. However, the watermark appears immediately when the colors are separated for printing or xerography. This renders the document useless to the printer unless the watermark can be removed from the color band. This approach is used commercially for journalists to inspect digital pictures from a photo-stockhouse before buying un-watermarked versions. Watermarking can be applied in the frequency domain (and other transform domains) by first applying a transform like the Fast Fourier Transform (FFT). In a similar manner to spatial domain watermarking, the values of chosen frequencies can be altered from the original. Since high frequencies will be lost by compression or scaling, the watermark signal is applied to lower frequencies, or better yet, applied adaptively to frequencies that contain important information of the original picture (feature-based schemes). Since watermarks applied to the frequency domain will be dispersed over the entirety of the spatial image upon inverse transformation, this method is not as susceptible to defeat by cropping as the spatial technique. However, there is more of a tradeoff here between invisibility and decodability, since the watermark is in effect applied indiscriminately across the spatial image. Watermarking can be applied to text images as well. Three proposed methods are: text line coding, word space coding, and character encoding. For text line coding, the text lines of a document page are shifted imperceptibly up or down. For a 40-line text page, for instance, this yields 2**40 possible codewords. 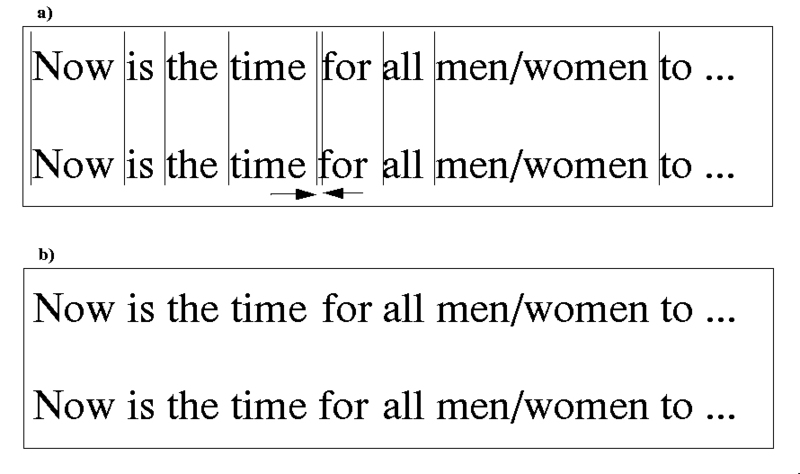 For word-shift coding, the spacing between words in a line of justified text is altered (see Figure 3). For character coding, a feature such as the endline at the top of a letter, "t" is imperceptibly extended. An advantage of these methods over those applied to picture images is that, by combining two or three of these to one document, two documents with different watermarks cannot be spatially registered to extract the watermark. Of course, the watermark can be defeated by retyping the text. Figure 3. 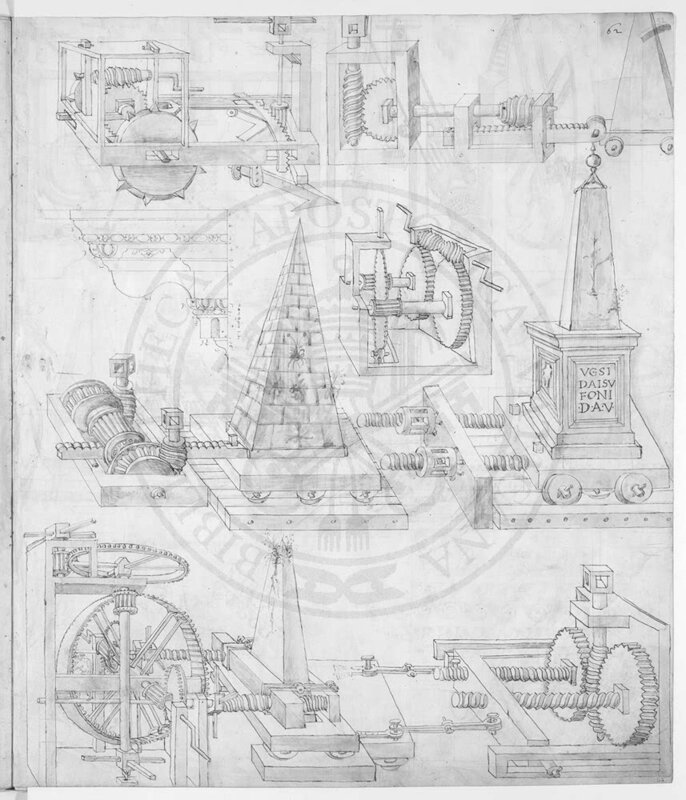 An illustration of textual watermarking. Note that the character "f" is shifted subtly to the left. this makes the watermark imperceptible under normal reading conditions. As of this writing, a counterfeiting scheme has been demonstrated for a class of invertible, feature-based, frequency domain, invisible watermarking algorithms. This counterfeiting scheme could be used to subvert ownership claims because the recovery of the digital signature from a watermarked image requires a comparison with an original. The counterfeiting scheme works by first creating a counterfeit watermarked copy from the genuine watermarked copy by effectively inverting the genuine watermark. This inversion creates a counterfeit of the original image which satisfies two properties: (a) a comparison of the decoded versions of both the original and counterfeit original yields the owner's (authorized) signature, and (b) a comparison of decoded versions of both the original and counterfeit original yield the forged (inverted) signature. This, the technique of establishing legitimate ownership recovering the signature watermark by comparing a watermarked image with the original image breaks down. It can be shown that both the legitimate signature and counterfeiter's signature inhere in both the watermarked and counterfeit watermarked copies. Thus, while it may be demonstrated that at least one recipient has a counterfeit watermarked copy, it can not be determined which it is. Though publishers have been clamoring for some means to protect their material on electronic networks, there has been no rush yet to embrace any of the current schemes. This could be just due to a period of inspection and appraisal, but our opinion is that publishers and scientists have yet to fully understand the practical specifications associated with the problem. Should the watermarks be visible or invisible? What constitutes invisibility? How difficult should it be to remove watermarks from images? How might one characterize "Good-Enough Watermarking" for different commercial and non-commercial applications? What constitutes a "reasonable" level of photo-editing? Or of degradation? Can the original image be required for decoding? Is transferal of the watermark from the electronic medium to the printed medium important? How are the watermarks to be policed? Etc. As scientists propose solutions and publishers experiment with them and debate their merits, some methods of watermarking will emerge as useful and widely used. When that happens, there will also be the emergence of external agencies for monitoring electronic copyright infringement (much the same as there are agencies for music and print copyright management). In the meantime, the challenge is for the scientists to develop ever more invisible, decodable, and permanent watermarking methods, and perhaps to meet even more specifications as they are demanded. The authors gratefully acknowledge IEEE Computer for permission to re-use parts of our earlier article. Berghel, H. and L. O'Gorman, "Protecting Ownership Rights through Digital Watermarking," IEEE Computer , 29:7, pp. 101-103 (1996). Craver, S., N. Memon, B. Yeo, M. Yeung, "Can Invisible Watermarks Resolve Rightful Ownerships?,"" IBM Research Report RC 20509 (July 25, 1996). O'Ruanaidh, J., F. Boland, and C. Dautzenberg, "Watermarking Digital Images for Copyright Protection," Proceedings of the IEE Conference on Image Processing and its Applications, Edinburgh, 1995, ppl. 326-330. J. Brassil, S. Low, N. Maxemchuk, L. O'Gorman, "Electronic Marking and Identification Techniques to Discourage Document Copying," IEEE Journal on Selected Areas in Communications, Vol. 13, No. 8, Oct. 1995, pp. 1495-1504. Zhao, J. and E. Koch, "Embedding Robust Labels into Images for Copyright Protection,", Intellectual Property Rights and New Technologies - Proceedings of the 1995 KnowRight Conference, pp. 242-251.